29 January 2015 Tirumala: Tirumala Tirupati Devasthanam Executive Officer Dr D.Samba Siva Rao lauded the efforts of TTD Annaprasadam wing for their impeccable companies to the multitude of visiting pilgrims and complimented the Deputy EO Sri Venugopal and his staff. 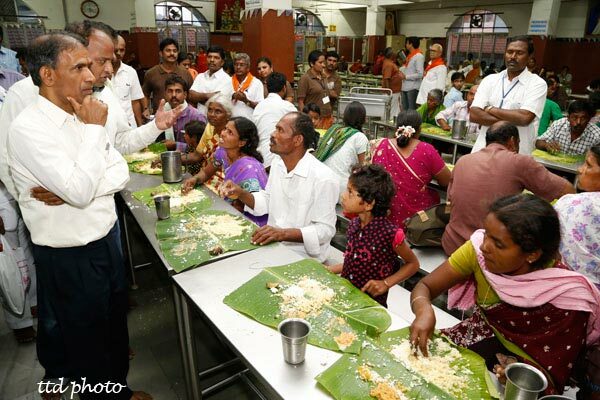 Addressing a special programme organised by the division in Matrusri Tarigonda Vengamamba Annaprasada Bhavanam assembly corridor, the EO stated, the companies of the division particularly within the areas where the pilgrims are made to attend for lengthy hours in Compartments, queue lines, kalyana katta, reception wings is commendable. “It is due to the tasty and hygienic meals which is being served to them at regular intervals, the pilgrims are maintaining patience despite lengthy waiting hours”, EO added. The Executive Officer additionally mentioned, “to date Rs.569 crores have been collected within the coffers of Annaprasadam Trust and if another 250 crores will get added, then the trust will become self sufficient. Then we are able to spend Rs.75 crores interest amount which is the precise expenditure incurred by this division in 12 months. It is as a result of the donors are additionally proud of the providers extended by this division and I am sure we are going to attain the required goal within no time and want you to proceed related providers in future too”, he maintained. Earlier, JEO Sri K.S.Sreenivasa Raju additionally appreciated the efforts of the division. Deputy EO Sri Venugopal, Catering Officer Sri Shastry, AEOs, Deputy Catering Officers, different workers members had been additionally current.